Killaghy Castle is a self-catering accommodation, sleeping up to 18 people. The castle has been owned by numerous families over the years. The present owners are Pat and Maria Collins who bought the property in 1995. They have ran the business successfully for 22 years, their daughter Eileen is now running the day to day operations at Killaghy Castle. The family have spent several years renovating the Castle to ensure that it offers tourists a totally relaxing and tranquil break. It was their priority to adopt a sensitive approach to the restoration project, jensuring that the Castle retained its historic feel while providing all modern conveniences. It has many period features, ornate cornices, high ceilings of 14 foot and large rooms with marble fire places, fully functional with firewood provided. Guests comment they had the best night sleep ever in the large bedrooms. The family currently farm extensively on the estate. The castle has Internet / Wifi access as well as Sky satellite TV with Sky sports and movies provided. Killaghy Castle is situated 300 yards from the village of Mullinahone, Co. Tipperary, and is ideally located for touring the South East of Ireland. The property has beautiful views and is perfect for a relaxing or active break. We accommodate a total of 20 people. The castle is a perfect venue for family gatherings, reunions, celebrations, wedding parties, and golf outings. It is located centrally in Ireland making it a perfect base for taking day trips to the magnificent visitor attractions of Ireland. Each bedroom is unique in decor with its old world charm and every modern conviences you could require. There are sleeping places for 20 people. There is a minimum stay for two nights. The weekly and weekend rate depends on the number of people staying. Please e-mail us for a definate quote. The castle is situated centrally in Ireland making it accessible to many airports and the magnificent and historic sights of Ireland. Gardens: Killaghy castle is set in a mature estate. A large terrace area equipped with seating is perfect for BBQs during the Summer months. A tennis court and childrens playground are located at the entrance to the castle, ideal for guests who like to exercise during their stay. The professional catering kitchen is quipped with fridges dishwasher gas hob electric ovens and stainless steel work tops and all other catering utensils. The utility room is equipped with two washing machines and one tumble dryer. Private Chef and Daily Maid Services need to be requested on booking. My family ( 13) celebrated my husband and I 50th Anniversary at this lovely farm. The hosts, Pat & Marie were so gracious and friendly. Everything about our stay from the owners of T J Mack's Pub, local pizza and grocery just added more to our favorite memories of this enchanting country. Can't wait for a return visit. The Collins family are fabulous hosts. The castle was very clean and well appointed. It was perfect! Marie and Pat ensure that you are welcomed and comfortable in this home away from home. Situated in central County Tipperary, the Castle is a tranquil retreat that your family or group can relax in or escape to. It also accomdates activity outings to Roch of Cashel, Cahir Castle, Kilkenny Castle or Warerford City. Our multi-generation family appreciated the Castle's historical character and comforts of modern life, as well as the ample living space and outdoor room to run and play for children (ages 6 - 15) in the expansive walled garden. Killaghy Castle was a wonderful place for our family vacation. We enjoyed the location and the home was comfortable with plenty of space for all 19 of us. The nearby village was charming and friendly. The kitchen was fully stocked with everything we needed. The country setting was beautiful and extremely quiet. There were plenty of beds and bathrooms for everyone and the living room and dining room had seating for all of us. Marie was extremely helpful in answering questions and helping us organize our activities. She even arranged for a birthday cake so we could celebrate while we were there. She was not in our space but was available when we needed her for questions. Very nice cooking area, but the house was not clean for most preferences. The area was beautiful. Flies, webs, and insect nests were on drapery, and prolific everywhere. The master-bedroom even had mold on the drapes. The main area set-in showers were extremely small. One of the two larger (newer) showers was not usable, as it leaked to the floor below, an apparent problem before we arrived because a rug was hanging outside the window. No one was readily available to attend immediate issues, though family was staying in an apartment on the property. Fortunately, I was able to figure out where the fuse box was when one was tripped when a bulb hanging uncovered (there were others just hanging from wires) was broken. Of the 11 in our group, everyone was disappointed in the condition of the house, though the land/nature was lovely. Thanks for writing review as regards flies and bees when the big windows are left open all day they come in as there is all rose bushes outside windows.All those windows were dusted and cleaned by window cleaner before your arrival.As mould in lining of front drapes guests left windows opened before going touring and pulled drapes closed to keep sun out and there was a thunder shower and they got damp new drapes were ordered and are up this week.Ye had my phone number to ring anytime day or night as your daughter told me your grandson had a tummy bug and in case he wanted to go to hospital I said ring me anytime I would drive ye.As regards bulbs when ye rang there was maintance man on way in but your wife said you had found fuse box.All wiring is checked very year by electrician for insurance cover safety as regards bulbs hanging from cords that's there design with shades under them.The towel that was on shower door was extra mat to put on floor I think the shower head may have been positioned wrong as there has been no leakage this week.It was your daughter friend that recommended the castle to you that stayed previous year and the points you raised have been attended to. A must for your family vacation! Killaghy Castle lived up to expectations and surpassed others! Marie walcomed our family (10 of us) and was so gracious and helped us wiyh anything we needed! The castle is spacious with plenty of room for a large family and extremely comfortable. The grounds are breathtaking. We walked up to a local pub and the owner was also very welcoming. There is a local convenience store in walking distance from the castle. My brother has been to Ireland several times and said Killaghy Castle was one of his favorite locations! Highly recommend! It's was lovely having you and your family stay enjoying the castle and grounds. Thank you for taking the time to write the lovely review much appreciated. 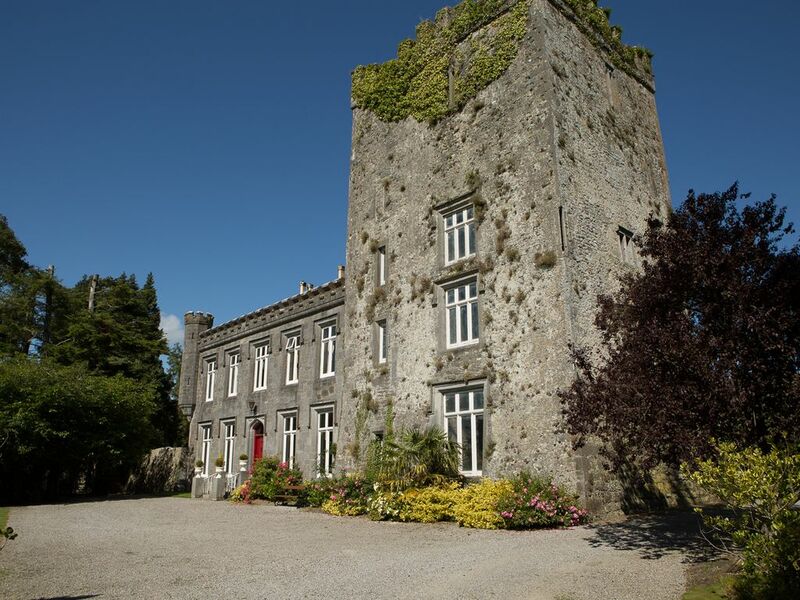 Killaghy Castle is situated in a serene location, 600 metres from the rural village of Mullinahone. There is a playground located at the entrance of the estate. The playground includes an all weather pitch, basketball court and tennis court. There is also excerise machines. There is a selection of pubs and shops in the nearby village of Mullinahone. The beautiful historic city of Kilkenny is a twenty minute drive away. The castle is within easy reach of airports and ferries. The closest international airport is Dublin, and is a distance of 160 KM. The location is perfect for touring the South East and South West of Ireland. Golf: Callan Golf Club and Mount Juliet golf course which was designed by Jack Nickalus and is one of Ireland's premier golf courses.